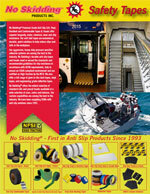 No Skidding® Heavy-Duty Industrial Grit Tape and Cleats are engineered for heavy-duty industrial environments including offshore marine applications, oil & gas rigs, heavy traffic areas, work areas, loading docks, stairways, ramps & walkways, bleachers, power equipment, the transportation industry and OEM applications. Our heavy-duty adhesive is designed to withstand some of the tougher environments where slip-and-fall prevention is required. 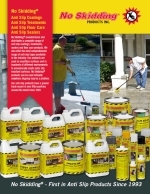 They offer the same slip-resistance as aggressive industrial anti-slip paint coatings with the ease of application of a peel and stick tape or cleat. These tapes are manufactured from a proprietary formula traction grit that is embedded into the product. These extremely durable tapes and treads are specifically developed to out-perform standard anti-slip tapes. For more information, please see product BROCHURE. Heavy-Duty Industrial Cleats - NS5900 - 3" X 24"
No Skidding® Heavy-Duty Industrial Grit Strips & Cleats are engineered for heavy-duty industrial environments - offshore marine applications, oil & gas rigs, heavy traffic areas, work areas, loading docks, stairways, ramps. Extra strong adhesive. Heavy-Duty Industrial Cleats - NS5900 - 4" X 12"
No Skidding® Heavy-Duty Industrial 4"X12" Strips for heavy-duty industrial applications - offshore marine, oil & gas rigs, heavy traffic areas,work areas, loading docks, stairways, ramps. Extra strong adhesive. No waiting, no curing. No downtime. Heavy-Duty Industrial Cleats - NS5900 - 6" X 24"
Heavy-Duty Industrial Cleats - NS5900 - 6" X 36"
No Skidding® Heavy-Duty Industrial Grit Tape, 4"X30' for heavy-duty industrial applications - offshore marine, oil & gas rigs, heavy traffic areas,work areas, loading docks, stairways, ramps. Extra strong adhesive. No waiting, no curing. No downtime.